Borealis and Borouge, leading providers of innovative, value-creating plastics solutions, announce the launch of Anteo™, a new family of linear low density polyethylene (LLDPE) packaging grades for the global packaging market. Anteo delivers easy processability at lower extruder pressure, better sealing integrity and improved puncture resistance in combination with strong optics for enhanced shelf appeal. 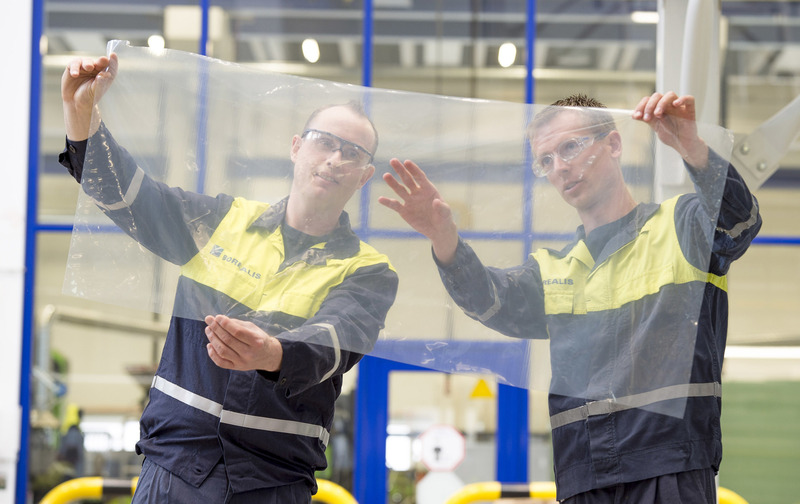 Boasting a unique combination of end-use properties for high-performance film applications, Anteo completes the full solution offer for high performance, multilayer flexible packaging applications using Borealis Borstar® Bimodal Terpolymer (BBT) Technology. Borouge produces Anteo at the Ruwais plant in the United Arab Emirates (UAE). The reliable supply of Anteo to customers around the world is assured thanks to Borouge’s production, material handling, and global supply chain capabilities. The global launch of Anteo is taking place simultaneously at three different geographic locations. The story of Anteo is highlighting the key aspects of the new technology and product, reflecting its uniqueness, usefulness and innovative elements: the launch of Borealis BBT Technology at the company’s Innovation Headquarters in Linz, Austria highlights the importance of the advanced and innovative technologies used to create the new product. Meanwhile, the launch of Anteo in Abu Dhabi, UAE, focuses on the significance of Borouge’s production facilities where the product is manufactured and exported from Abu Dhabi to both companies’ customers all over the world, who benefit from Borouge’s robust supply chain network. In Shanghai, China, the focus is on the development opportunities made available to provide Anteo product in such a huge market with an increasing base of current and potential customers. Borealis’ proprietary BBT Technology offers exceptional flexibility in polymer design by combining smart catalyst design with a superior, two-reactor system process with two comonomers. The result: unique polyethylene resins with superior processability. This property is augmented by other high performance-related attributes like flexibility, stiffness, toughness, purity, outstanding sealability, and appealing optics. It is the first time that Borealis and Borouge jointly manufacture a product at one single location and then make it globally available. This endeavour is enabled by the excellent cooperation and technology exchange between both companies. Customers benefit from guaranteed and consistent quality product and the companies’ joint supply chain capabilities across the globe. Unparalleled processability: easy processability at lower extruder pressure (over 15% less than conventional metallocene LLDPE sealants), with the derived benefit of lower energy consumption. Seal integrity and sealing speed: high speeds can be achieved when used as sealing material in laminated/non-laminated film, resulting in lower energy consumption and less material waste. A step change in puncture resistance: an important contribution to reducing spoilage and/or potential damage to pack contents. Pleasing optics for enhanced shelf appeal. The first grades in the growing Anteo product family, Anteo™ FK1820 and Anteo™ FK1828, are commercially available in Europe, the Middle East, Russia, Africa and Asia as of the global launch on 25 October 2017. Anteo is anchored in technology and innovation, production capacity and supply chain, and future application development. The official launch locales in October represent the varied contributions being made to creating, growing, producing, and marketing the Anteo flagship brand. Using the most advanced proprietary technologies such as Borstar®, Borlink™ and BNT, Borouge produces high quality polyolefin (polyethylene and polypropylene) solutions for packaging, infrastructure, energy, mobility, agriculture and healthcare applications that address global challenges such as climate change, food protection, access to fresh water, energy conservation, healthcare support and waste management. Started production in 2001 with 450,000 tonnes per year, Borouge’s annual capacity has dramatically increased to reach 4.5 million tonnes in 2015 thanks to its three state-of-the-art plants located in Ruwais, 250km west of Abu Dhabi, UAE. Borouge’s production site has become the largest integrated polyolefins complex in the world. Borouge has also expanded its commercial and logistics network in the Middle East and Asia to become closer to its customers and be able to meet their increasing requirements. Supported by its world-class Innovation Centre in Abu Dhabi and its expanded Application Centre in Shanghai, Borouge focuses on providing creative plastics solutions that have a positive impact on society today and tomorrow for a variety of industry segments inspired by its mission, ‘value creation through people and innovation’. Borouge is committed to the well-being of its people and to the principles of sustainability in the communities where it operates. Aligning with ADNOC through embracing the four pillars of People, Performance, Profitability and Efficiency, Borouge is directly contributing to Abu Dhabi’s downstream and supporting its economic growth and diversification goals.